The Yankees, Dodgers and Giants were the last three big league teams to provide regular radio broadcasts of their games. It wasn’t until 1939 that the Big Apple baseball franchises set aside their fear that such broadcasts would reduce gate attendance and joined the rest of baseball by putting their home games on the air. The thrifty Yankees and Giants decided to share an announcer since the teams never played home games on the same dates and they co-hired a play-by-play veteran named Arch McDonald who had been doing the radio broadcasts for the Washington Senators. Needing to replace McDonald, the Wheaties cereal people, the Senator’s radio sponsor, hired a young CBS game-show announcer who had also done some news reporting and college football assignments for the network. His name was Mel Allen Israel. But before the Birmingham, AL native announced his first Senator game, Clark Griffith vetoed the hiring so that Washington pitching legend, Walter Johnson, could take the job. By 1940, McDonald was looking for a new assistant in New York and ended up giving the job to Allen who at the behest of CBS had dropped the Israel surname. 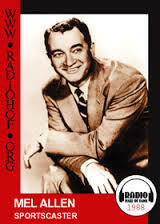 During the next two and a half decades, Mel Allen became the “Voice of the Yankees” and the most well-known sportscaster in all the world. His signature phrases “Hello there everybody,” “How about that?” and “Going going gone!” became part of every Yankee fans’ vocabulary as did the nicknames he assigned to Yankee legends. Joe DiMaggio became “Joltin Joe,” Tommy Heinrich, “Old Reliable” and Mickey Mantle, “The Magnificent Yankee.” Allen did not like it when the Yankees teamed him up with another Big Apple baseball broadcasting legend, Red Barber, in the mid fifties. He and Barber would become the first two diamond broadcasters to be enshrined in Cooperstown. Mel also did not approve of Phil Rizzuto being given a microphone in the Yankee booth when New York’s front office forced Scooter to hang up his playing uniform during the 1956 season. First of all, the Scooter’s hiring caused the firing of Allen’s much-liked protege, Jim Woods. Mel also strongly disapproved of Rizzuto’s lackadaisical attention span and his misuse of the English language. Ironically, it had been Allen’s invitations to Scooter to join him in the booth during the later innings of games at the end of Rizzuto’s playing career that led to his hiring. Allen was unceremoniously dumped when CBS purchased the Yankees in 1965 in a cost-cutting move. George Steinbrenner got him rehired to do games on cable during the mid seventies and Allen’s hosting of the popular “This Week in Baseball” once again made him one of the sports best known voices for a whole new generation of fans. He died in 1996. It wasn’t until last month, when my wife and I took a tour of the new Yankee Stadium that I realized Allen had been given a plaque in the team’s Monument Park. He certainly earned one. This former Yankee reliever, this one too and this one-time Yankee utility infielder were each also born on Valentines’ Day. “Old Reliable” played some great baseball for New York during an 11-season career that was interrupted by military service in WWII. A .282 lifetime hitter, Henrich teamed with Joe DiMaggio and Charlie King Kong Keller to provide pre-war Yankee fans with one of the most talented outfields in team history. 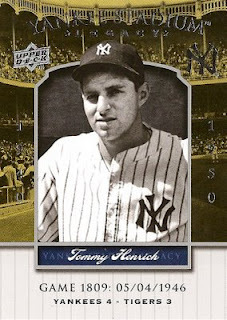 Tommy won four rings as a Yankee and hit a home run in each of the four Fall Classics he appeared in. But his most famous Series moment took place in Game Four of the 1941 Yankee-Dodger matchup. Brooklyn was about to even that Series at two games apiece when Henrich came to the plate in the bottom of the ninth with two outs and New York losing 4-3. Dodger reliever, Hugh Casey struck out Henrich with a curveball in the dirt that scooted past Dodger catcher, Mickey Owens, permitting Tommy to reach first safely. The Yankees went on to score four runs that inning, winning the game. The following day, Tommy hit a home run to help the Yankees win the Series. Henrich was 96 years-old when he passed away in December of 2009. He absolutely loved being a Yankee. Another Yankee born on February 20th, was involved in a famous play that started out by him doing something bad that was turned into something really good. February 20th pinstripe birthdays also belong to this one-time, short-time Yankee pitcher, this brand new Yankee catcher and this long-ago Yankee catcher.